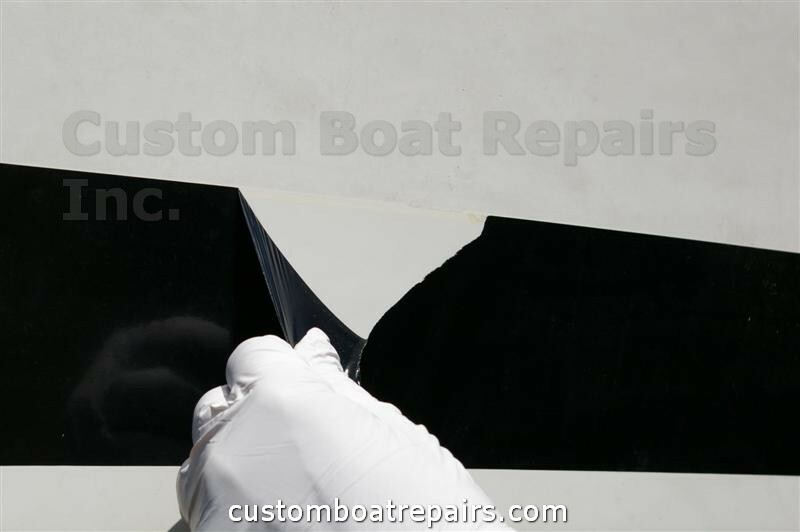 As boats get older, the decals and striping tape start to peel and crack. 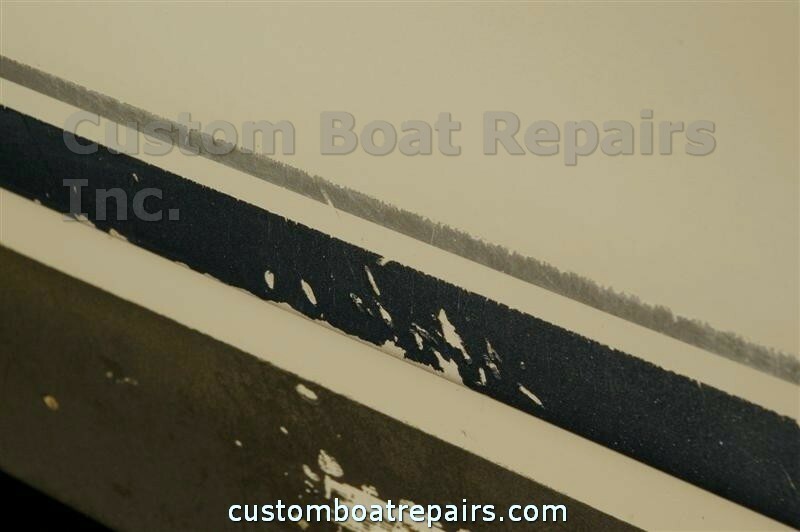 Over the years I've seen boat owners attempt to remove damaged stripes with razor blades. This is the wrong way. 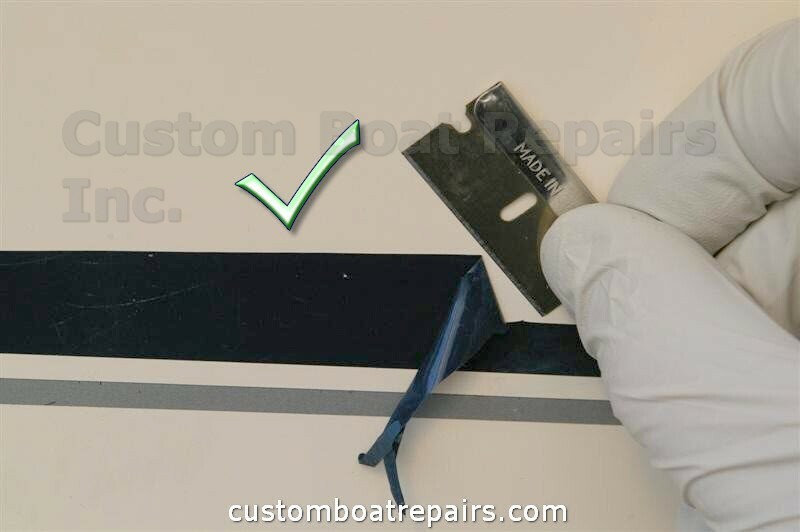 Razor blades, no matter how careful you are, will dig into the gel coat, leaving gouge marks. 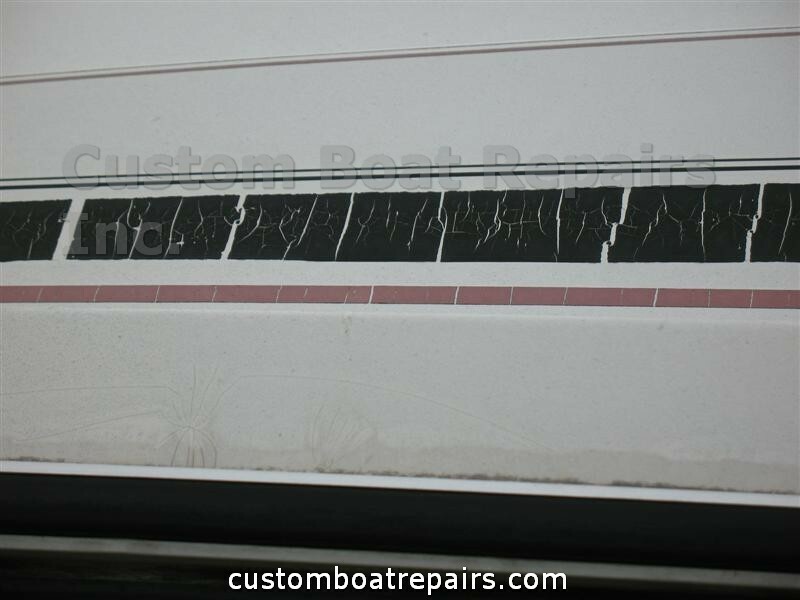 These marks will be visible through newly applied striping tape, making the job look terrible. 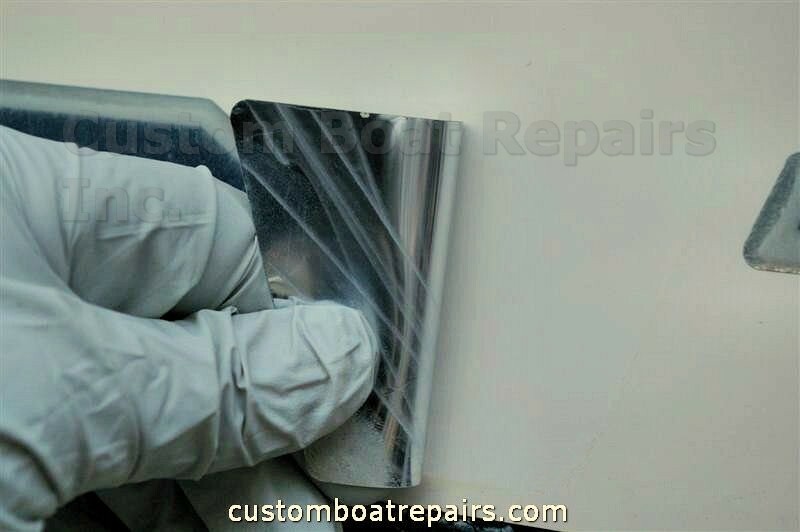 Because of this problem the boat owner gets so disgusted that he gives up on the job only after gouging out the hull with the razor blade. 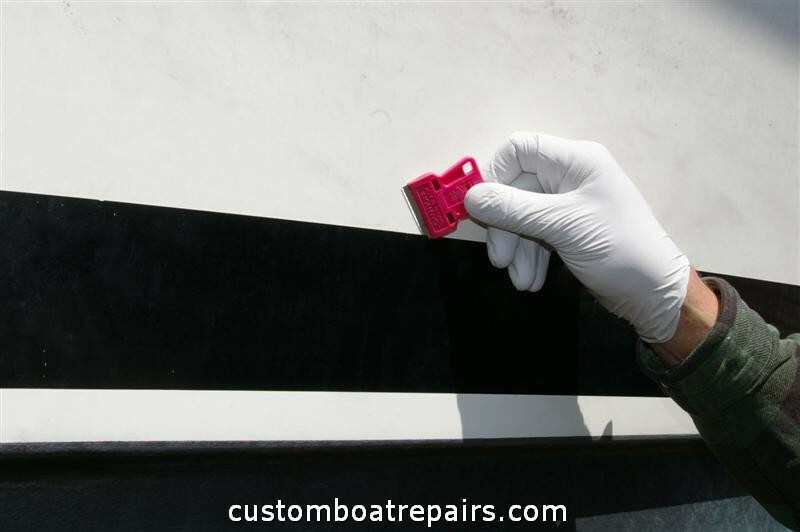 With my step-by-step guide, this problem is now solved, And you can remove striping tape just like the professionals without incurring the professional cost. 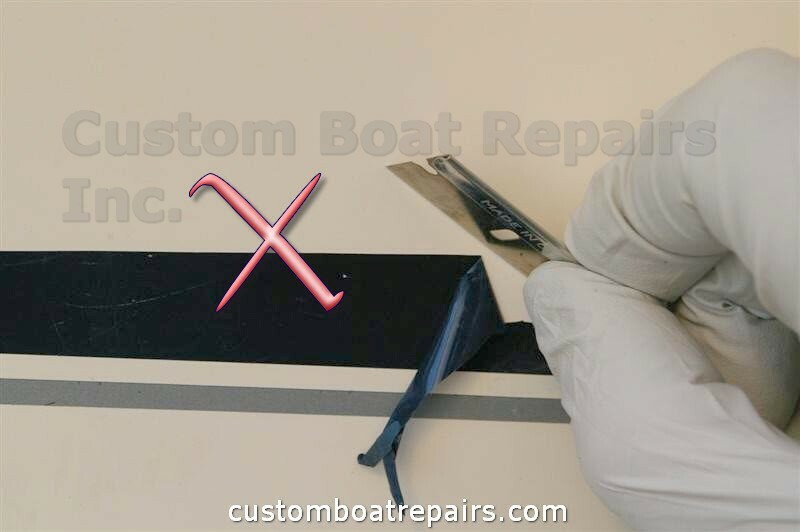 In this section I will show you how to remove striping tape in two ways. 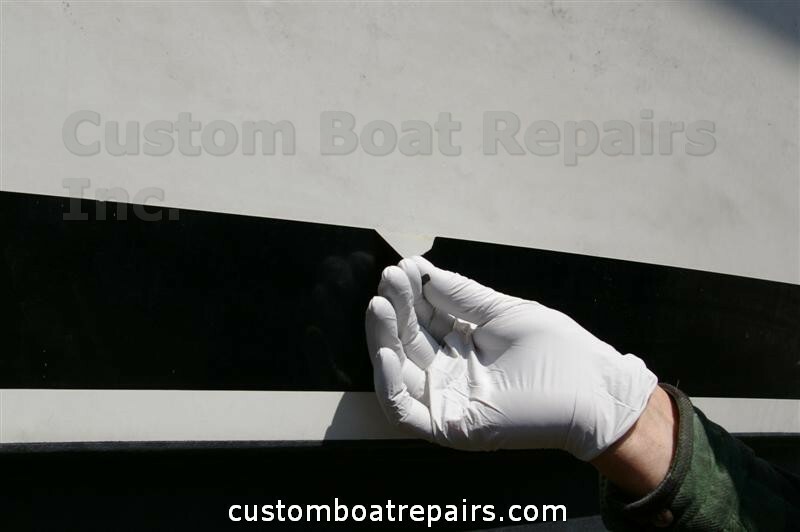 The first is by using a heat gun (if the stripe is still in fairly good condition); and the second (for those stripes that are cracked, old, and peeling) is by a tool that fits on a electric hand drill which takes them off with friction, leaving no damage to the gel coat. Both are great ways of removing stripes, saving you money and many hours of labor. 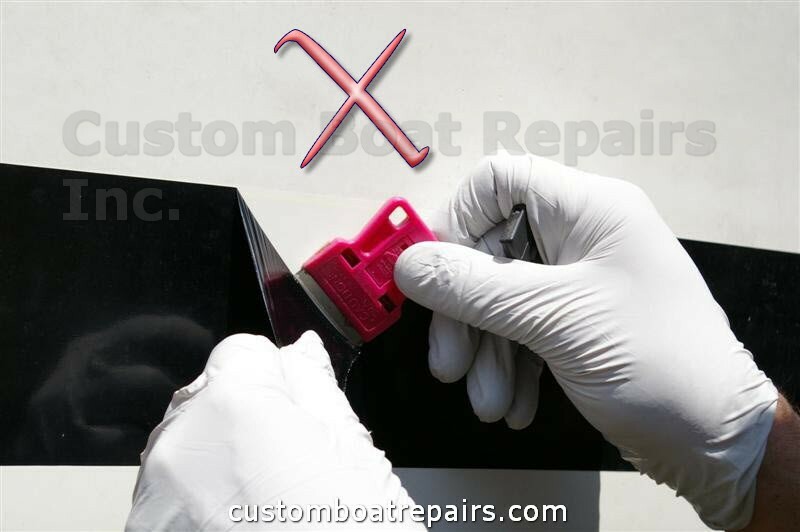 Removing stripes that are in fairly good condition, meaning without cracks, can be taken off with a heat gun faster then by using the removal tool. 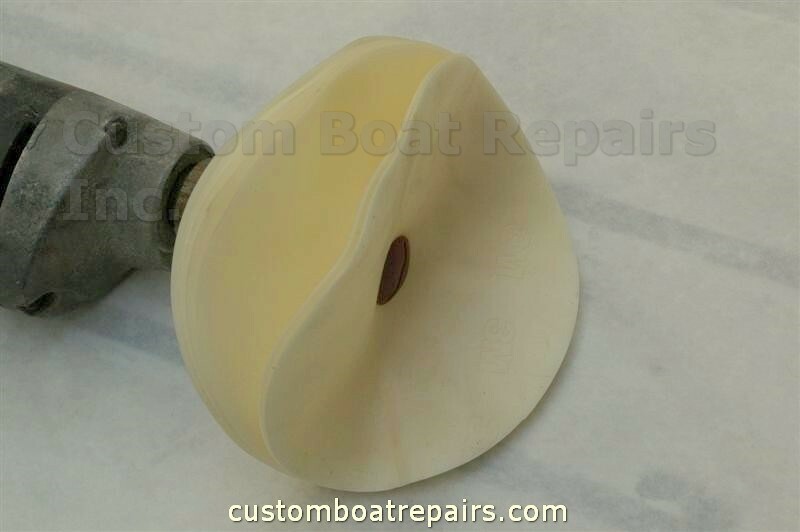 Stripes that are old, cracked, and peeling need to be taken off with the removal disc tool. When using the removal disc tool, wear a face shield and long-sleeved shirt. The rubber particles from the tool and striping tape are hot and can burn you. Only use a razor to lift the edge of a stripe, removing the rest by hand. 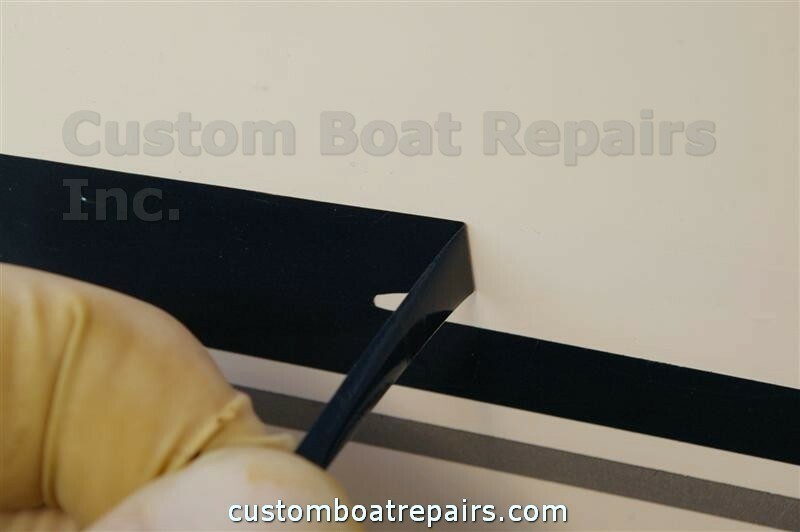 Always hold the razor at a 5-degree slant to the hull. If you hold it over a 10-degree slant, the edge will gouge out the gel coat when you push on the razor. 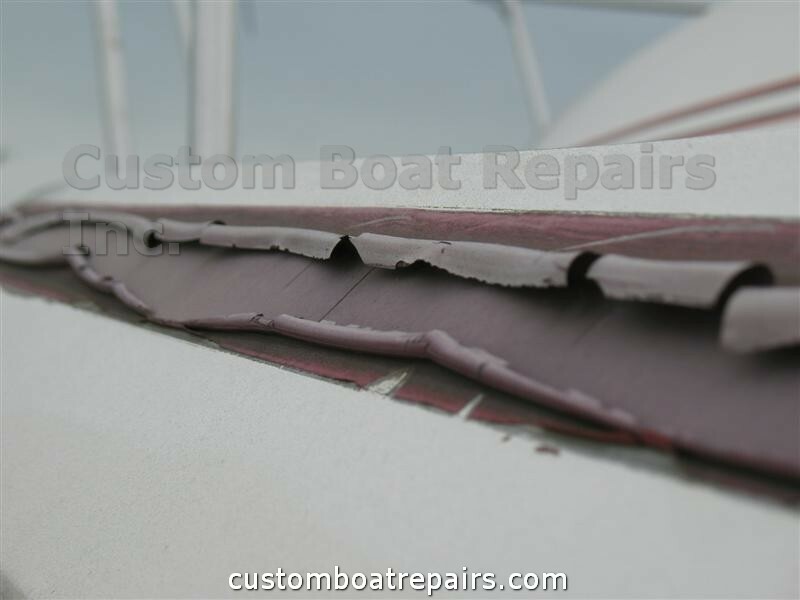 Use a heat gun to soften the stripe prior to removal. Do not pull the stripe immediately after applying heat. 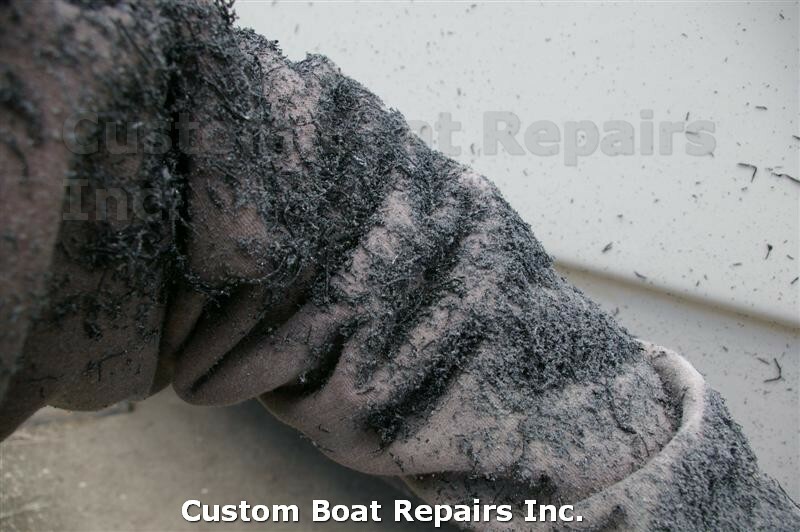 Always have the heat gun 6 to 12 inches forward of the area that you are removing. If you heat the area and pull right away, the stripe will be so soft, it will stretch and break, and you will have to start all over again. Compound the surrounding area after the old stripe is removed and before new striping tape is applied. 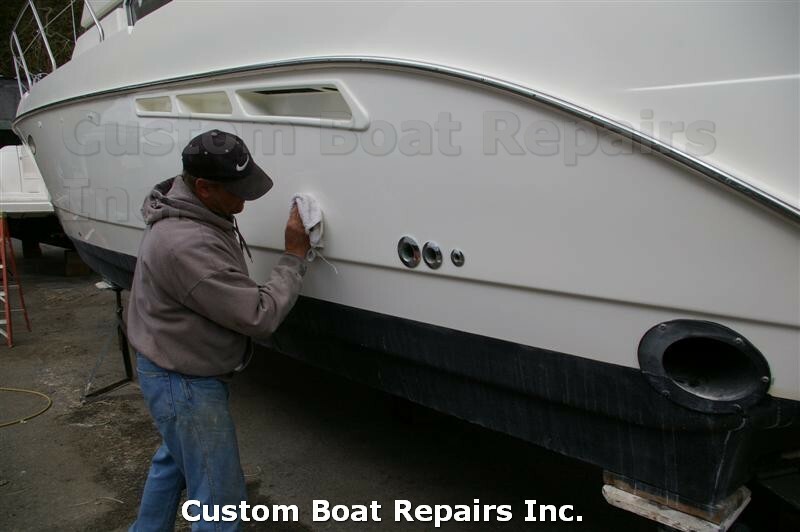 You do not want to compound the area after applying new tape for fear the buffing machine will rip it off. 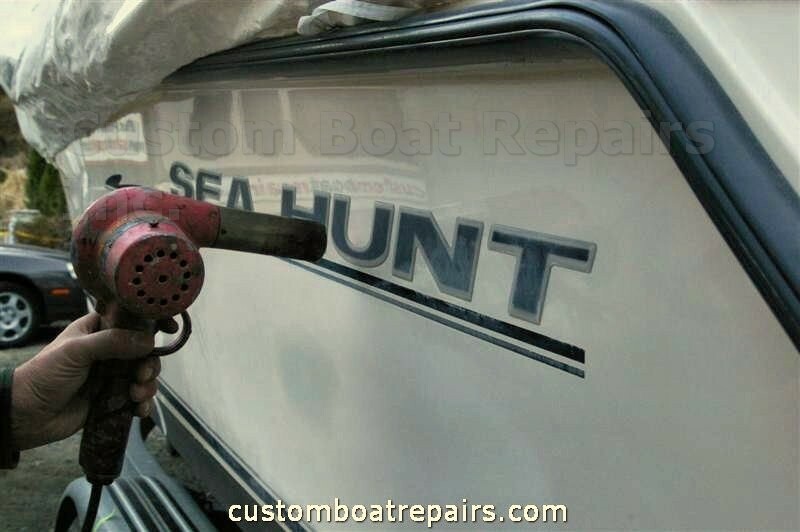 I've seen spray-on decal/tape removers on the market. 3M makes a few. I don't recommend using these if the gel coat is old or faded. 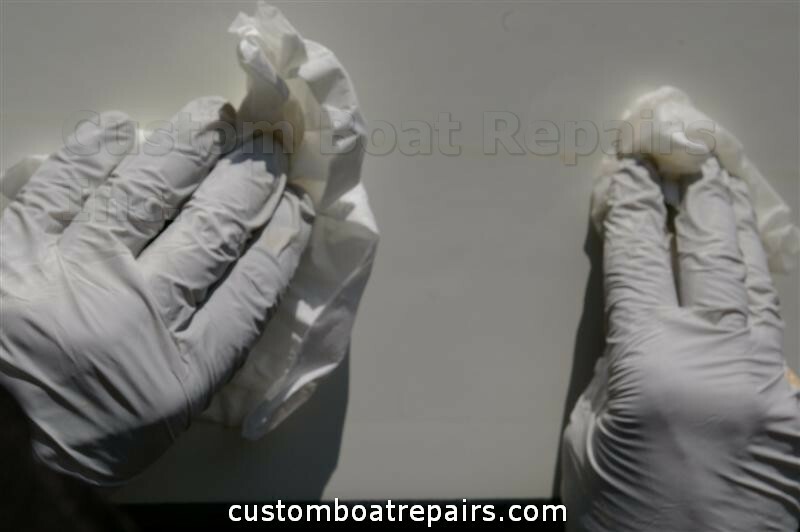 The spray material gets into the pores of the gel coat and can cause staining—if not right away, then later on as the boat ages. These stripes have dried out and cracked. Never put new stripes over old stripes. This will cause peeling later on. Clear plastic coating on stripes was not removed after stripes were applied. 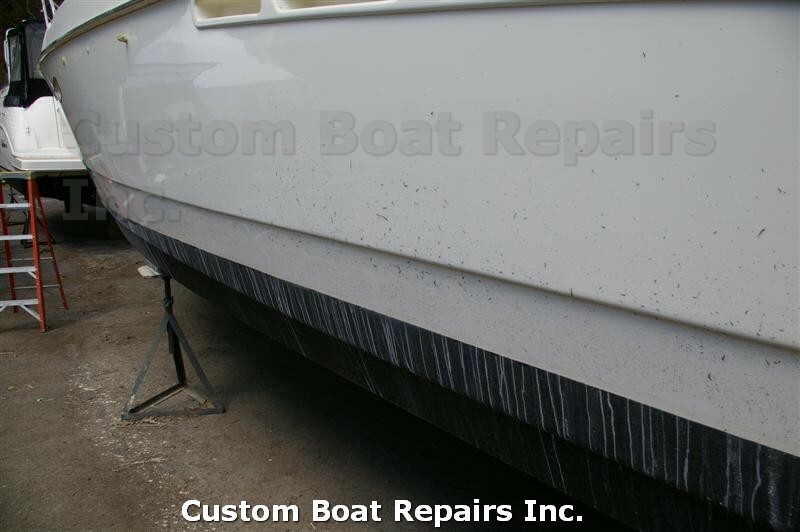 Waterline stripes wore away from the boat fenders. 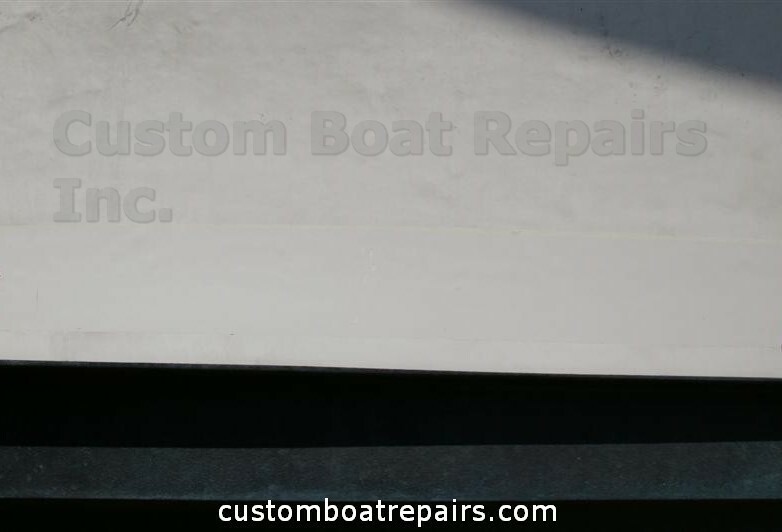 Waterline stripe, clear plastic coating not removed. Note: As of writing this, the following links work. If clicking on them gets you nowhere, type the tool part numbers directly into Google. 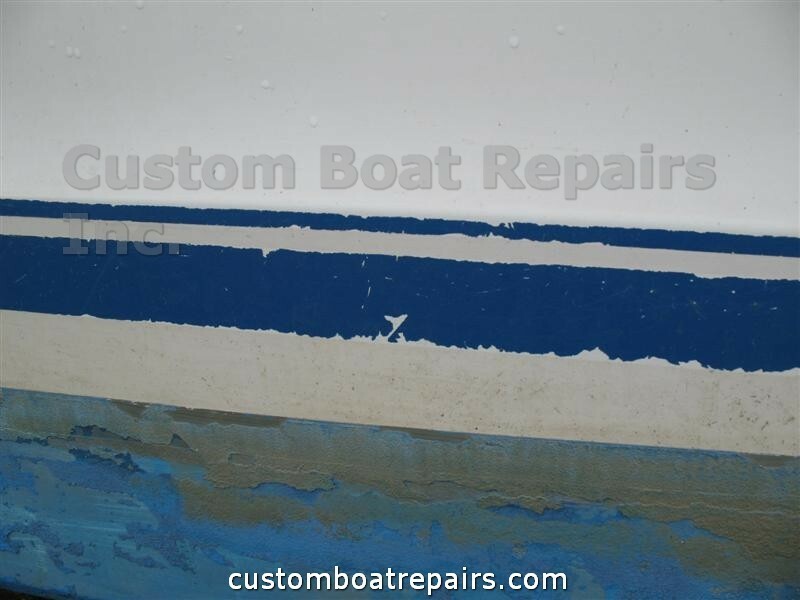 In this picture I’m starting to remove a waterline stripe. As you can see, the sun has warmed up the stripe for easy removal. If it’s cloudy outside, you’ll need to use the heat gun to achieve the same effect. I used the razor only to start the edge for something to grab. If you have good fingernails, you maybe able to pick a section loose. Now grab the tape and gently pull. Go too fast and it will break. The trick here is to keep the tape warm while using steady pulling pressure. Note: If you heat the tape too much, it will stretch and break. If you use the right amount of heat(in this photo the heat from the sun softened the stripe) and a controlled pulling motion, the stripe should come off easily. Never use a razor scraper to remove a stripe. You can damage the gel coat. This is what can happen to the gel coat if you use a razor scraper. This will create more work for you. 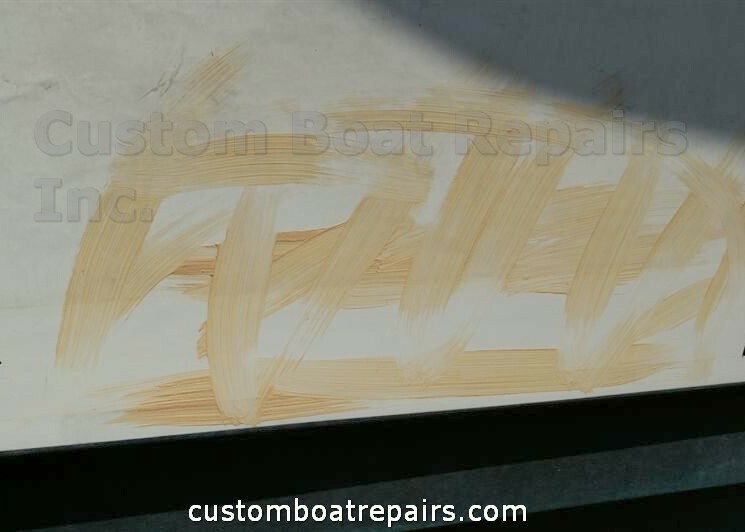 The gouges have to be filled in with gel coat before you can put a new stripe on the boat. 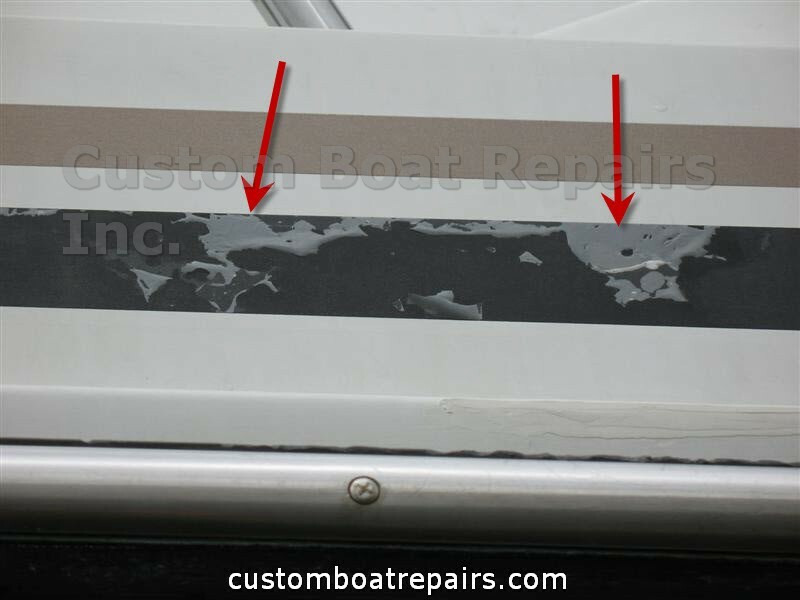 Notice the color difference under the stripe and how dirty the boat is above. The stripe protected the gel coat from the sun’s UV rays as well. Now you have to compound the area clean. Follow the directions in my compounding section for this step. 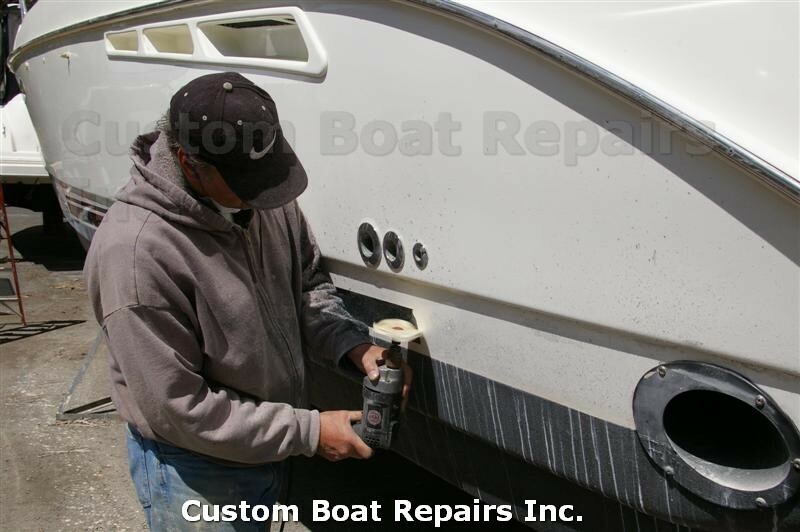 If you try compounding it later, after the new stripe is on the boat, you have a good chance of ripping the stripe off with the buffing machine. Work the area well with the buffer. You’ll never get the same color match as underneath the stripe but, you can get close. 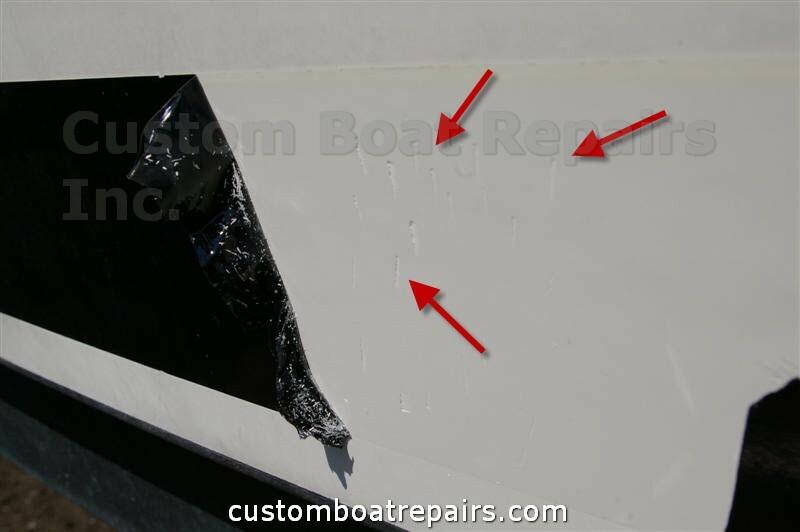 After compounding, you’ll see some areas (denoted by red arrows) where the stripe adhesive is still stuck to the hull. 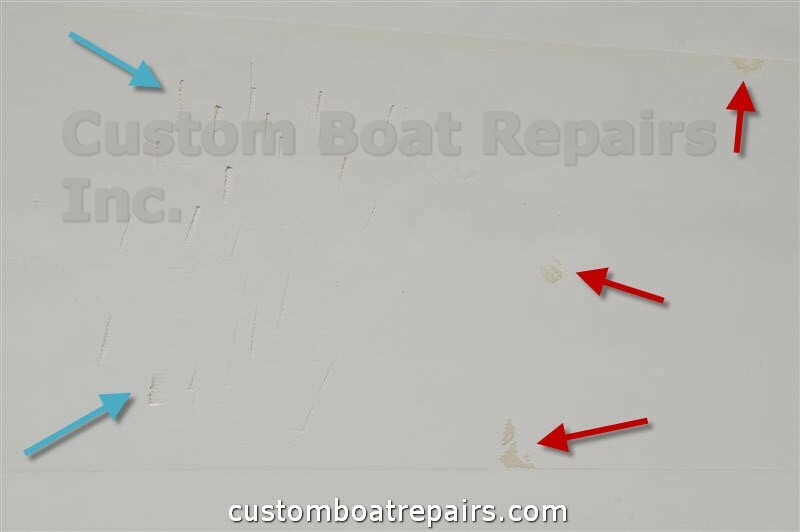 There may also be gouges in the gel coat (denoted by blue arrows). Wipe the area down with lacquer thinner to remove the stripe adhesive, then wipe it dry. 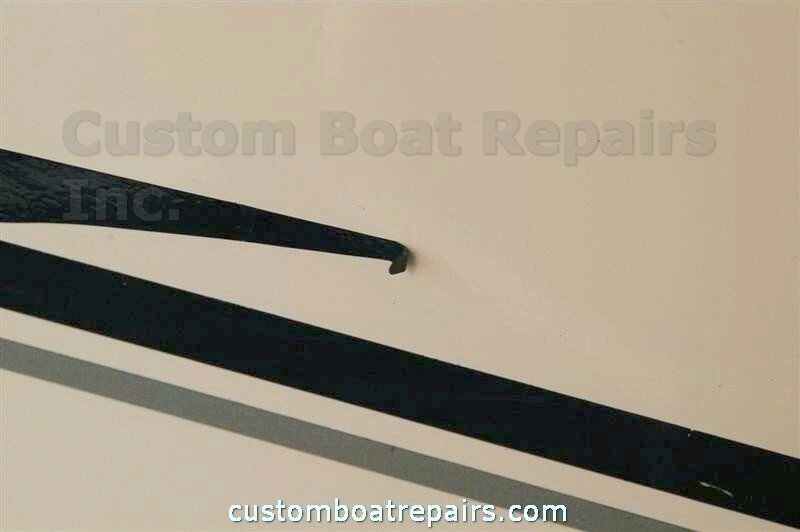 This is an accent stripe on the side of the boat. 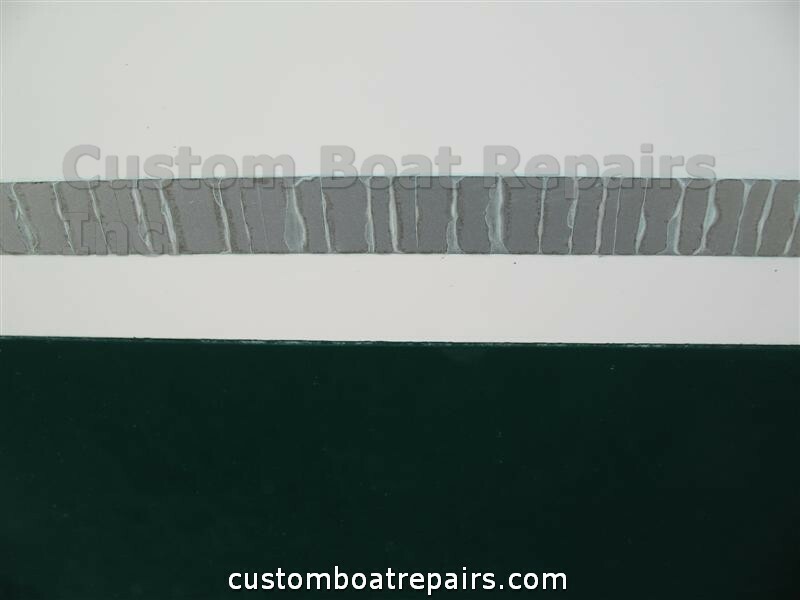 Thin stripes break faster than the thick ones used on the waterline of the boat. The trick to removing the stripe here is to position the heat gun about 6 to 12 inches forward of the area while pulling the stripe off in the same direction of the heat gun. If you heat the area and then start pulling right away, it will be so soft that it will stretch and break. If you see the tape stretching, wait until the area cools down. If you don’t, it will break and you’ll have to start from scratch. Never use a razor at this angle. You’ll damage the gel coat. Hold the razor edge almost flat to the surface, and only use it to lift a small lip to pull the stripe by hand. Do not use the razor to remove the whole stripe. Here is the removal disc tool. It works fast to remove stripes. 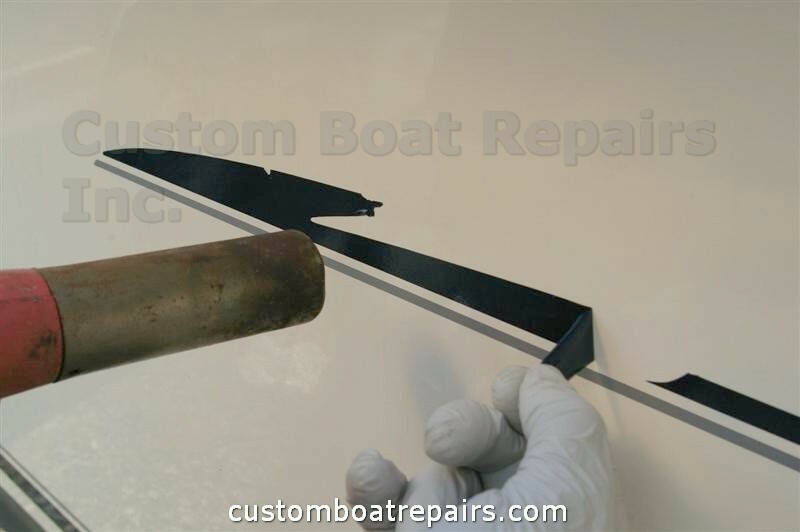 The cost for this tool is around $25, and it can remove a 2-inch wide waterline stripe on a 20-ft boat before it wears down and become useless. 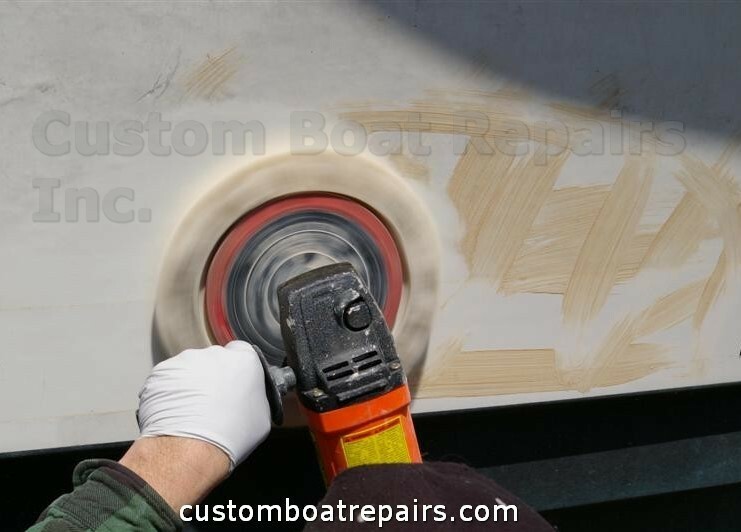 Here I’m removing a waterline stripe using the disc. I love this tool. It removes cracked, damaged, and very old stripes quite fast. The only caveat is that you have to wear a lot of protection. The rubber disc and stripe particles being removed are hot and can stick to your skin like glue. You need to wear a face shield and a long-sleeved shirt. Close-up of removal disc tool in action. For this tool to work properly, you need a high-speed drill. Read the disc packaging for what is recommended. Mine is on an old Black & Decker drill that was made just for this tool; however, this drill is not available anymore. 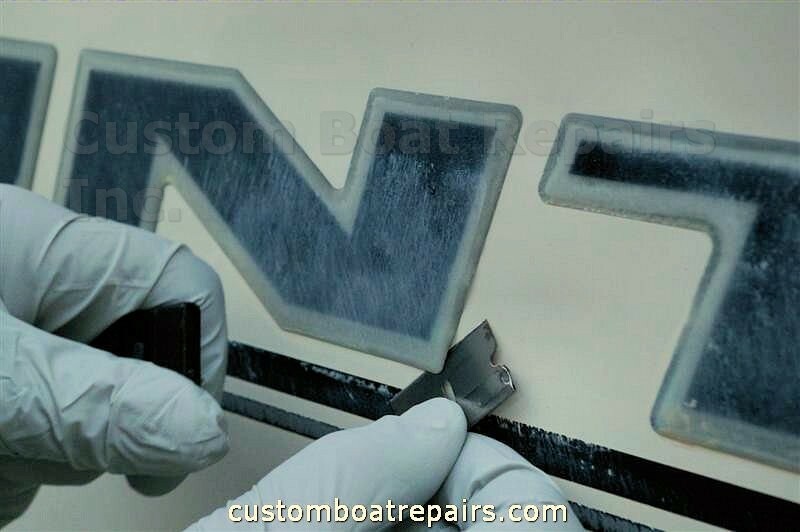 In this photo you can see how using the removal tool removes the decal. This is why you should wear a long sleeve shirt. These small particles are very hot when being remove, and may burn your arm. This is what the hull looks like with the small decal particles all over. 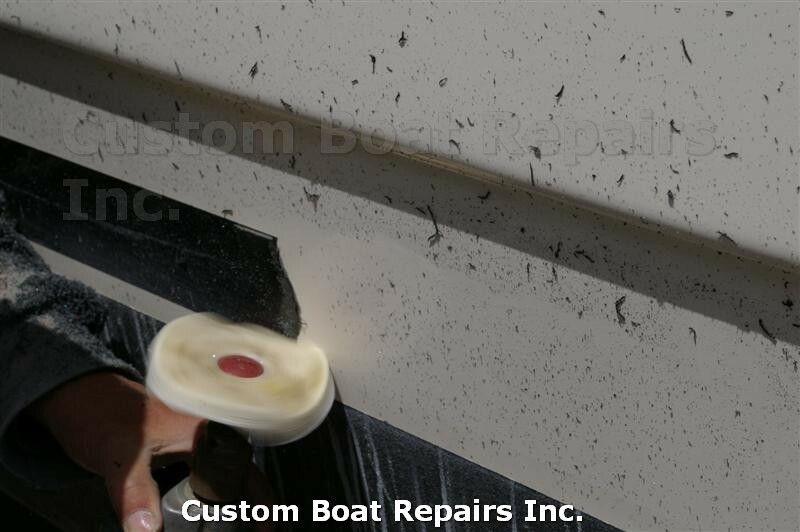 After your done you must blow off or wash clean the side of your boat of all the small decal particles. If you don’t and you start to put the decal on, these particles will stick to the decal and ruin the job. Here I’m removing the nameplate. These are very thick. You cannot use the removal disc to lift nameplates; a heat gun is the only thing that will work. After you warm up the decals, use a razor to lift a corner edge. Grab hold and pull gently. You have to be careful, as you’ll remove the gel coat if you yank it hard.